Check out some of our offerings! Are you an adult looking for resources for a young person? This drop-in group is a safe and supportive environment for LGBTQA youth and their allies ages 18 and under to discuss issues of coming out, school, work, and relationships in a group of their peers and to socialize and meet new friends. Facilitated by trained volunteers, and supervised by Pride Center staff, the group empowers youth to become strong, independent, and community-minded and provides them with the opportunity to meet like-minded peers across school districts. 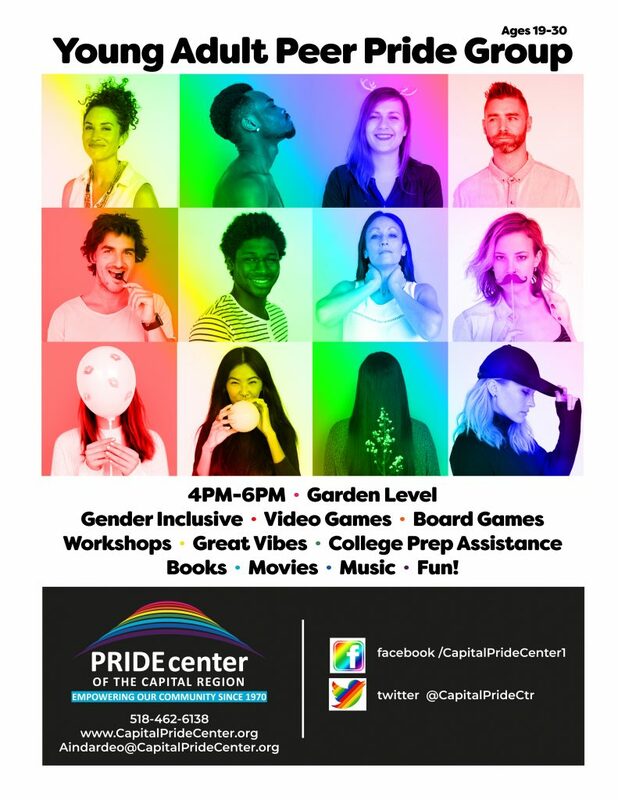 For more information about any of our Youth Groups, please contact programs@capitalpridecenter.org or call 462-6138. This drop-in group is a safe and supportive environment for trans* and gender non-conforming youth ages 18 and under to discuss issues related to gender identity and expression. Open to youth who may identify as trans*, genderqueer, intersex, agender, bigender, gender non-conforming, or questioning! 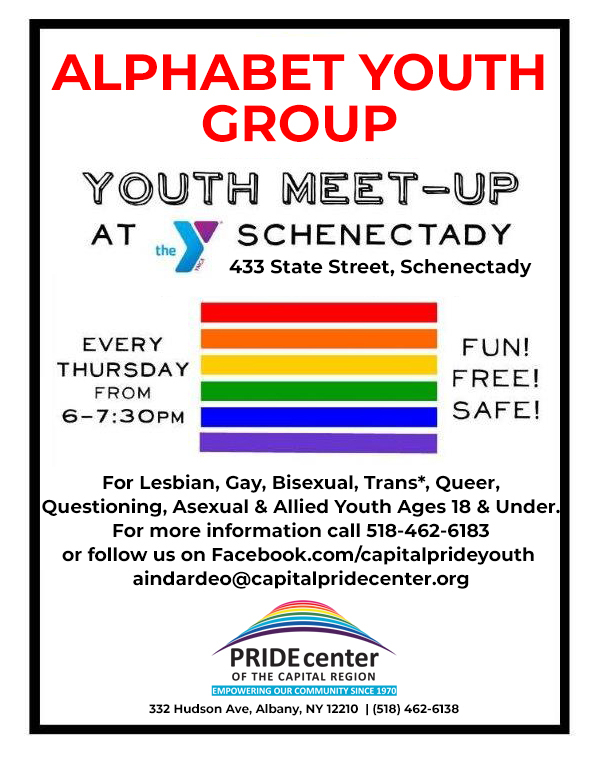 For more information about any of our Youth Groups, please contact programs@capitalpridecenter.org or call 462-6138. This drop-in group is a safe and supportive environment for LGBTQA youth and their allies ages 18 and under to discuss issues of coming out, school, work, and relationships in a group of their peers and to socialize and meet new friends. Facilitated by trained volunteers, this group empowers youth to become advocates for themselves and provides them with the opportunity to meet like-minded peers across school districts. 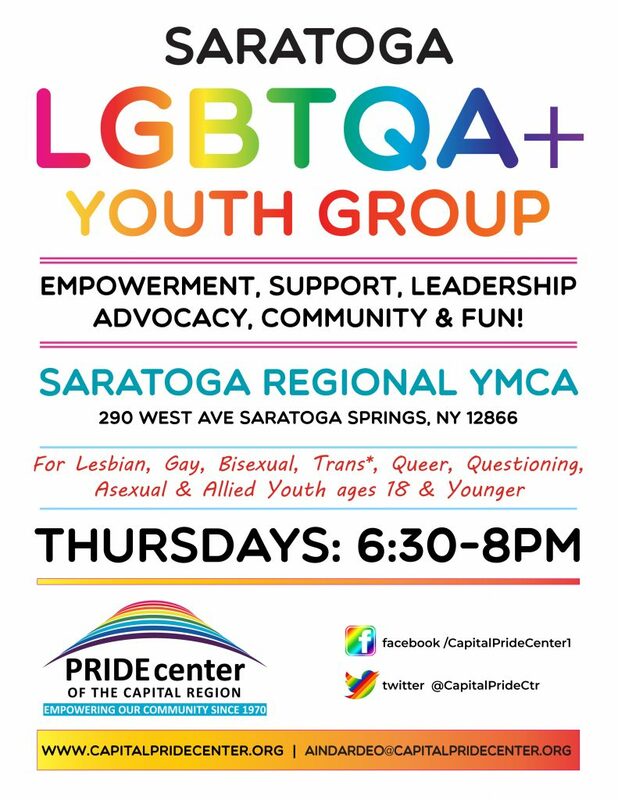 For more information about any of our Youth Groups, please contact programs@capitalpridecenter.org or call 462-6138. Check out our Pride Center Youth FACEBOOK PAGE for all the updates! Working with LGBTQA youth and their allies, the Pride Center empowers them to use their voice and tell their stories to elected officials on state and local levels in order to make a change in our community. Because we are based in the seat of NYS government, youth members have a unique opportunity to make their voices heard on a state level. Opportunities include legislative visits and training, writing workshops and regional conferences on youth empowerment. Building positive relationships is essential to all youth, but for LGBTQA youth, many times opportunities are limited. The Pride Center coordinates the LGBTQA Alternative Youth Prom each year, along with our community partners, and over 400 youth participate each year, along with almost 100 chaperones. This event, as part of Capital Pride week, gives participants a memory of a welcoming prom for years to come. Other social events include an annual Youth BBQ during the summer months, as well as other events throughout the year. Looking to start a GSA (Gay-Straight Alliance) or an LGBTQA student group at your school? Take a look at some of the resources below to help you get started! 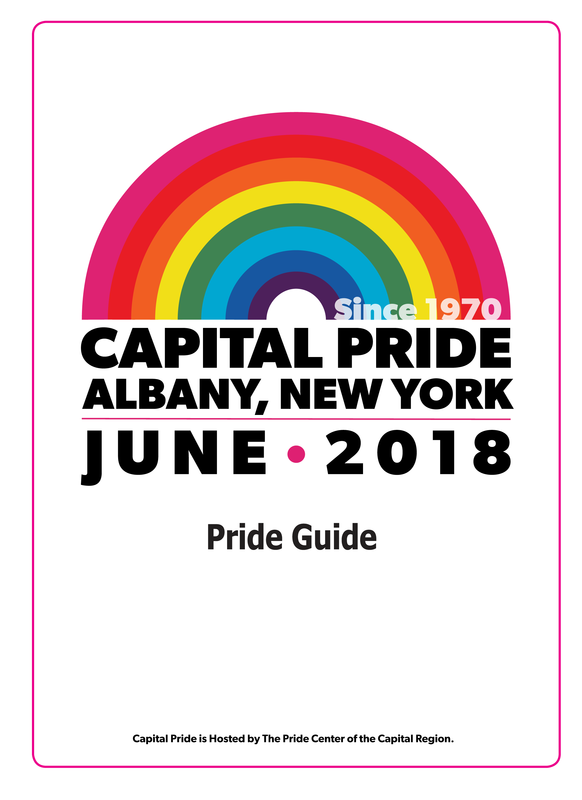 To talk with us more about this, call the office at (518) 462-6138 or email programs@capitalpridecenter.org! We work with students from all over the Capital Region to make schools more welcoming places to be! The Pride Center works with over 30 school districts in the Capital Region to build welcoming environments for all students regardless of sexual orientation or gender identity. We also provide presentations and in-service training to local and regional community organizations and agencies on promoting positive LGBTQA youth development. 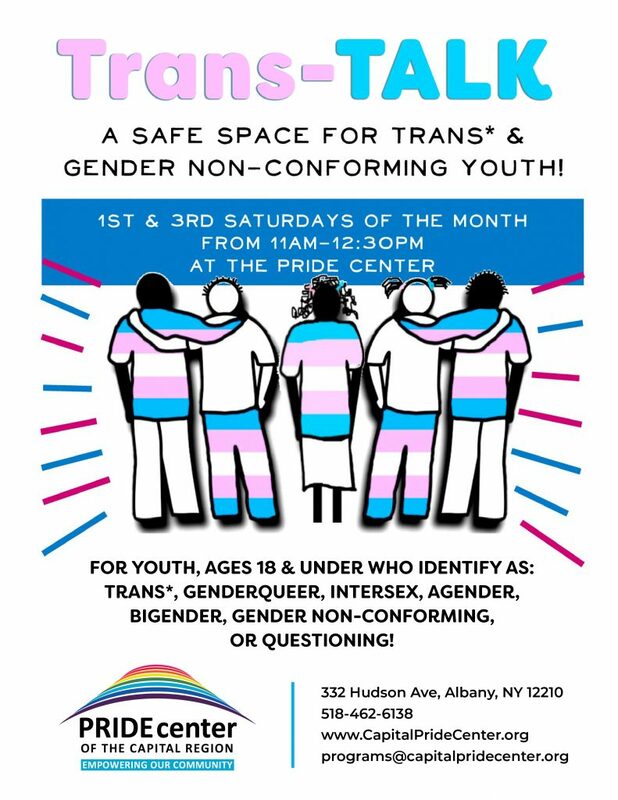 If your agency is interested in working with the Pride Center, please contact our office at (518) 462-6138. The Gay-Straight Alliance (GSA) Network, supporting the work of school-based LGBTQA groups.